Travel Blog If it feels good - DO IT!! 4 am starts are never fun, but I was very thankful that I had had the foresight to hire a porter to hawk my bag back down to the bus stand for me. The stand was packed and completely incomprehensible as usual but I asked someone who pointed out the right bus. And so the journey began. It wasn't even semi deluxe – just ordinary, which means a 2 plus 3 layout rather than 2 plus 2. I had a window seat and initially the bus was quite empty so I was able to get a bit of shut eye but soon enough people started piling on and the bus was way beyond its capacity. It's very common for way more than one to a seat so I wasn't surprised to have 3 generations of a family sitting beside me (on one seat) at one point in the journey. The mountain going was pretty but very slow and bumpy. The hours passed and by 11am I was the only one except for the driver who was still there. Even the conductor had changed! I thought the journey was supposed to take 10 hours but when we pulled up a dirt track sometime near midday I knew we were not going to be in Haridwar by 3pm. The bus reached a type of garage and everyone was asked to get off. During the hour's wait the bus had a new alternator and a front left tyre fitted. Good job too as the bus had only started with a push all morning and the tyre was bald as a coot. 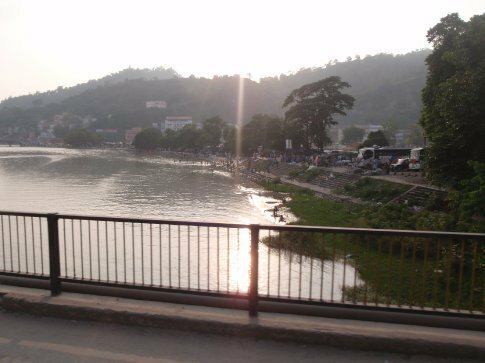 We finally reached Haridwar at about 5pm and I was able to catch my first few glimpses of the Ganges river. Haridwar is supposed to be one of the oldest cities in the world but I had no desire to stay for more than minutes. It looks like it's ancient, but not in the way Rome or Athens might. 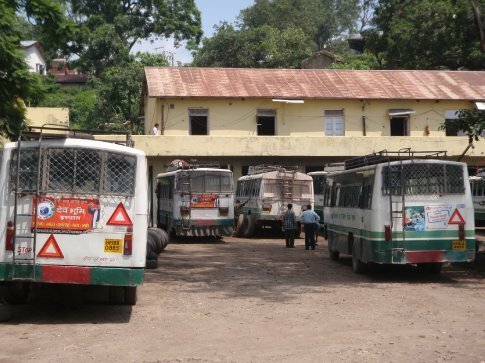 Thankfully the bus to Rishikesh left only minutes after I arrived. A short trip crossing back over the Ganges and I was in Rishikesh. Finally. 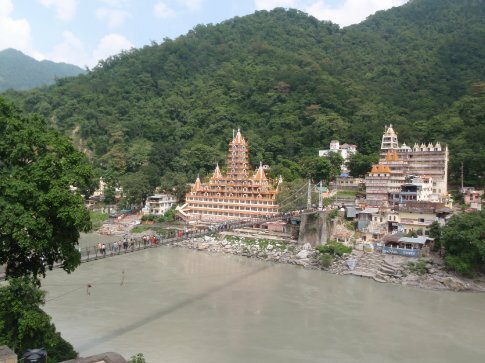 I had been looking forward to this part of the journey in India since I arrived – Rishikesh was where I would stay at an ashram, in peace and solace and away from the noise and pollution. As such I had been kind of expecting a mellow place, along the lines of Macleod Ganj. I couldn't have been more wrong. The centre of town is smoggy and smelly, the drivers are even more noisy and aggressive than usual and the rickshaw wallahs overcharge at will. After bargaining one quickly down to half his asking price I made for my hotel. I actually had a reservation this time at the Ishan hotel, overlooking the Ganges at Laksman Jhula. Sadhus and beggars lined the streets with hands outstretched as I made way to the hotel. I think my tiredness has a massive effect on the first impressions of a place. After a cold shower I had a quick look around and found a slightly magical place. Pilgrims bathing and performing candlelit rights in the river, spanned by an attractive suspension bridge for pedestrians. The sounds of mantras wafting in the warm air. I felt even better after having eaten. The restaurant underneath the hotel is brilliant. They even had apple crumble and custard. I ate way too much but not even the pain in my stomach could prevent me from sleeping. I hadn't written the blog since Macleod ganj and was still behind so I wrote that in the morning. 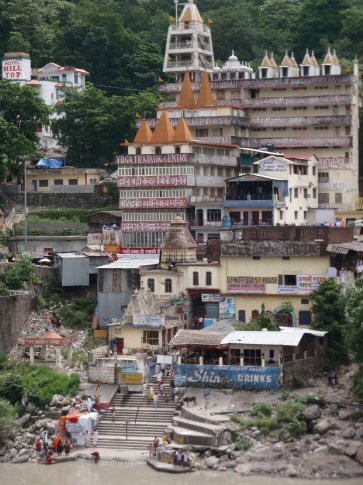 After lunch I took a walk across to the other side of the river with its tall temples and bathing ghats. I plied the streets and finally went down a long track. It didn't lead to the other bridge, as I suspected so I turned back, giving the Sadhus I had ignored on the way down, a second chance to beg for alms. The whole point of the walk had been to visit an adventure outfit called Red Chili adventures. I wanted to arrange a rafting trip for after I come out of the ashram. I took a more direct route and found them and made some plans. 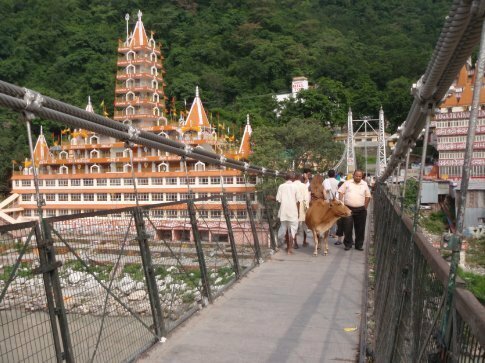 Rishikesh is a funny old place – on one hand it's clearly a very spiritual place but on the other is the commercial side of spiritualism. There are gazillions of ashrams and it was incredibly difficult to research remotely. 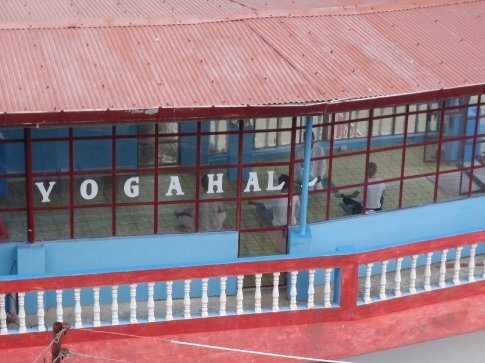 There is one “ashram” beside the hotel which is a hotel with a glasshouse on the top – people's yogic and spiritual journeys are made for everyone to see and very much within earshot of the beeping and the touting. Tomorrow I go into the ashram I have chosen. I hope that I've made a good choice but I have only one way to tell. And I'll write about that when I come out! In order to avoid spam on these blogs, please enter the code you see in the image. Comments identified as spam will be deleted.